This was actually a bit of a impromptu pre wedding trip so, before we headed off on our Ukraine culinary trip mum and I spent 3 nights in Rome. Our first stop was to find our air bnb. Arriving quite early we were able to enjoy the morning. The taxi we took drove through empty streets and tiny alleyways, empty bridges and quiet piazzas. Our air bnb host Fabiola met us with her husband and we had a morning espresso together in a cute little coffee bar around the corner from our place. After a welcoming morning we went up to our apartment. The large windows looked out onto a gorgeous street and I had the best feeling walking up to the tall windows and opening them out onto the street. Looking down below I could watch the Roman life for hours, but I didn’t do that as I wanted to be down there myself. There was no energy to lie down, even though I never sleep on a plane. That weird state of disbalance, exhaustion yet utter excitement and adrenalin to explore and soak in a city was inside of me. So we went exploring. Not hard at all, in this part of town to instantly decide you are going to live here one day. After about 30 minutes my mum said to me “okay, yes…….I know why you love this place so much now”. Another espresso and we were ready to continue to walk. Walking past the pantheon, we found breakfast. A huge antipasto board. All i wanted was Italian salumi and it was so so good. For me an Italian breakfast isn’t pastry, it’s salumi (I know thats not tradition). Nothing can be better than artisan salumi and fresh juice (and…more coffee). And then we walked. Walked more than ever. Exploring and taking snaps of as much as we could take in. We found a prosciutto bar where we had to really control ourselves! And we left with a bag full of different cured meats, cheese and more. You never know when you are going to get hungry in Rome! (fast forward to 2am that evening when we woke up…this bag full of cured meats saved our hungry stomachs). The day finished about 5pm when we couldn’t do much more (jetlag). We went down to a small pizzeria and bar next to our airbnb, mum tried her first aperol spritz ever. We could barely finish our food after that one aperol spritz but we did happily but half asleep and then walked home. In bed by 5:30pm we both woke up at 2 am. Hungry and completely awake. We opened up all the salumi and prosciutto we bought earlier and had a mini feast. Excited and actually with energy, we thought…why not go for a walk. It was warm out, and we were in Rome. So, off we went. We were the only people on the street. Apart from some policemen around, and some friends ending a wine filled night. We walked through Piazza Navona, The Pantheon, and up to the Trevi fountain. It was one of the best moments I’ve had in Rome. Alone, with the eternal city around you. It was just us, the lights and colours of the Roman walls at night, and the sound of the fountains and streets. I would definitely recommend everyone do a small walking tour of Rome after 2am. Artisan ice cream that really is artisan ice cream. Seems like this is the buzzword around all of Italy which does at times get misused. This place was right around the corner from our place and it’s close to Piazza Navona, so if you’re nearby it’s definitely worth the visit, plus you get to pass by lots of other cute boutique stores, cafes and food stores. The fresh fruit and flavours for the gelato are prepared right in front of people passing by, it’s hard not to stop by for a quick gelato at this place. The three days that we were there, there were beautiful melons and lots of chocolate, nuts and more in the window sills. Definitely a great way to catch someones attention! Recommended by a butcher the we passed by, this trattoria gets packed with local workers for lunch (local recommendations are never a let down). I actually thought I lost the name for this little gem but luckilyyyyy I found their business card in my bag. ALWAYS take a business card when you travel and eat out so much! This was mums and I favourite meal. We walked in quite early which was a great thing because we apparently had to make a booking, luckily we did and came back when they opened for lunch. It was packed in minutes. The trattoria is cozy, old, casual and smells fantastic. The food is traditional Roman and we had a chicory salad with anchovy sauce that was one of the best side salads of my life. We also had 2 plates of pasta. Home made pasta at it’s best. A traditional ragu for me and ravioli with spinach and sage for my mum. Close to Campo di fiori this little pastry shop has the most delicious savoury and sweet pastries, pies, pizzas, cakes, tarts, biscotti and more. We came back here twice and bought our airplane food here before our flight to our next destination. My mum fell in love with cannoli here, she was surprised at how much flavour and crunch cannoli actually has rather than over sweetened and with soggy pastry. Packed with a line of 20-30 people in front of us, but worth the wait. We were brought here by my husbands friends. The locals do know the best places. Roman pizza, thin crust. This place was UNREAL and I have some photos below. We walked in and there was a kitchen bench full of pizza bases being topped with fresh ingredients, and another cook adding the olive oil and the other pizza chef making the bases and another one running the pizza oven. It was incredible to watch. Their system was VERY efficient. We had lots of pizzas to share and their fried cod is also their specialty which was very good too. For a casual dinner and a great aperol spritz this place is it. So many places water down their aperol spritz, but these guys make it well! Our first and last aperol spritz in Rome was right here. 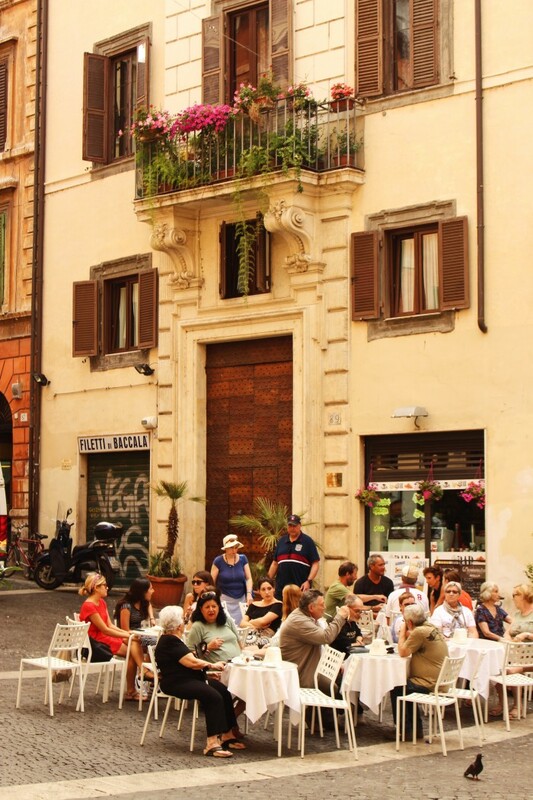 Very close to Piazza Navona as well and close to the gelataria that I mentioned above. These were my favourite places to eat from this trip, we also ate at some other places throughout our trip but they weren’t like WOW places so I’m not including them, like a Osteria that looked good but could have tasted better (I did love their warm octopus salad and pesto pasta…and the gnocchi with vongole was good at the time but now thinking back it could have been better though) and also we stopped off at a mozzarella bar which was nice but nothing beat meeting with our friends buffalo cheese farm owner who came all the way from Naples. He also brought lots of delicious buffalo milk goodies – mozzarella and ricotta, made that morning and made directly from fresh buffalo milk. Thanks to our friends at Burraduc farm in Seal Rocks for organising this meet up with Guiseppe Morese cheese. I can’t wait to be in Italy next, my husbands friend is getting married there next spring (europe spring) so we will try pop over then. But also, I’m organising something quite exciting with our good friend from Naples and Amalfi region. I can’t wait to share more info on that as we progress! Thanks for that and keep up the good work.